Vermilion Energy will be hosting its 2019 Annual General Meeting of Shareholders in Calgary on Thursday, April 25, 2019. Please visit our events & presentations page for more information. For the 2019 Shareholder meeting, we have elected to use the Notice and Access model ("N&A") for the delivery of meeting materials to our Shareholders. Adopting N&A to deliver materials is more environmentally friendly as it reduces paper use and also lowers the Company's costs for printing and mailing. If you have any questions or would like to receive a paper copy of the Information Circular by mail, you may call 1-866-895-8101 or email us at investor_relations@vermilionenergy.com (there is no charge to you for requesting a paper copy). 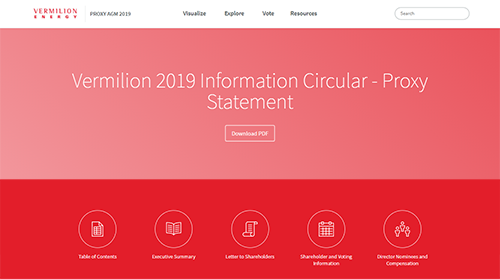 We are pleased to provide our shareholders with a new and interactive online format for reviewing our information circular. This enables shareholders to immediately access key proxy information online. For current Board positions, please visit our Directors page.